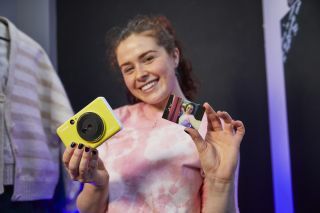 The Canon Ivy Cliq is the baby in the new Canon instant film camera range. Known as the Canon Zoemini C in Europe and the Ivy Cliq in North America, this is a stripped down version of the Ivy Cliq+/Zoemini S but still offers both a digital camera and a Zink instant print camera in the same device. The Canon Ivy Cliq has a 5 megapixel digital camera with a built-in optical viewfinder, and a microSD card for recording your images. The fixed lens focuses automatically with the closest AF distance being 50cm. The ISO range of the digital camera is limited to ISO 100 - 1600. The built-in printer uses the same Zinc paper technology used in Canon pocket printers, and this creates borderless prints of up to 2 x 3 inches. Unlike the Ivy Cliq+/Zoemini S the Cliq does not offer Bluetooth or NFC connectivity – so you can't use this to print off images from your smartphone. The Cliq has a built-in flash - but does not feature the eight LED lights of the Ivy Cliq+/Zoemini S.
The camera weighs 170g and measures Approximately 121 x 78.3 x 23.7 mm. It is powered by a rechargeable battery that can produce around 25 prints per charge. The Canon Ivy Cliq will be available in colors that include Bumblebee Yellow, Seaside Blue and Lady Bug Red and will retail for $99 from April.